Node Hero was a Node.js tutorial series focusing on teaching the most essential Node.js best practices, so one can start developing applications using it. With our new series, called Node.js at Scale, we are creating a collection of articles focusing on the needs of companies with bigger Node.js installations, and developers who already learned the basics of Node. In the first chapter of Node.js at Scale you are going to learn the best practices on using npm as well as tips and tricks that can save you a lot of time on a daily basis. npm install is the most common way of using the npm cli - but it has a lot more to offer! In this chapter of Node.js at Scale you will learn how npm can help you during the full lifecycle of your application - from starting a new project through development and deployment. Before diving into the topics, let's see some commands that help you with what version of npm you are running, or what commands are available. As most cli toolkits, npm has a great built-in help functionality as well. Description and synopsis are always available. These are essentially man-pages. This runs a package's "test" script, if one was provided. To run tests as a condition of installation, set the npat config to true. When starting a new project npm init can help you a lot by interactively creating a package.json file. This will prompt questions for example on the project's name or description. However, there is a quicker solution! Finding the right packages can be quite challenging - there are hundreds of thousands of modules you can choose from. We know this from experience, and developers participating in our latest Node.js survey also told us that selecting the right npm package is frustrating. Let's try to pick a module that helps us sending HTTP requests! One website that makes the task a lot easier is npms.io. It shows metrics like quality, popularity and maintenance. These are calculated based on whether a module has outdated dependencies, does it have linters configured, is it covered with tests or when the most recent commit was made. Once we picked our module (which will be the request module in our example), we should take a look at the documentation, and check out the open issues to get a better picture of what we are going to require into our application. Don’t forget that the more npm packages you use, the higher the risk of having a vulnerable or malicious one. If you’d like to read more on npm-related security risks, read our related guideline. Once you found the package you want to include in your project, you have to install and save it. The most common way of doing that is by using npm install request. Even if you save modules with exact version numbers as shown in the previous section, you should be aware that most npm module authors don't. It’s totally fine, they do it to get patches and features automatically. The situation can easily become problematic for production deployments: It’s possible to have different versions locally then on production, if in the meantime someone just released a new version. The problem will arise, when this new version has some bug which will affect your production system. To solve this issue, you may want to use npm shrinkwrap. It will generate an npm-shrinkwrap.json that contains not just the exact versions of the modules installed on your machine, but also the version of its dependencies, and so on. Once you have this file in place, npm install will use it to reproduce the same dependency tree. To check for outdated dependencies, npm comes with a built-in tool method the npm outdated command. You have to run in the project's directory which you'd like to check. Once you maintain more projects, it can become an overwhelming task to keep all your dependencies up to date in each of your projects. 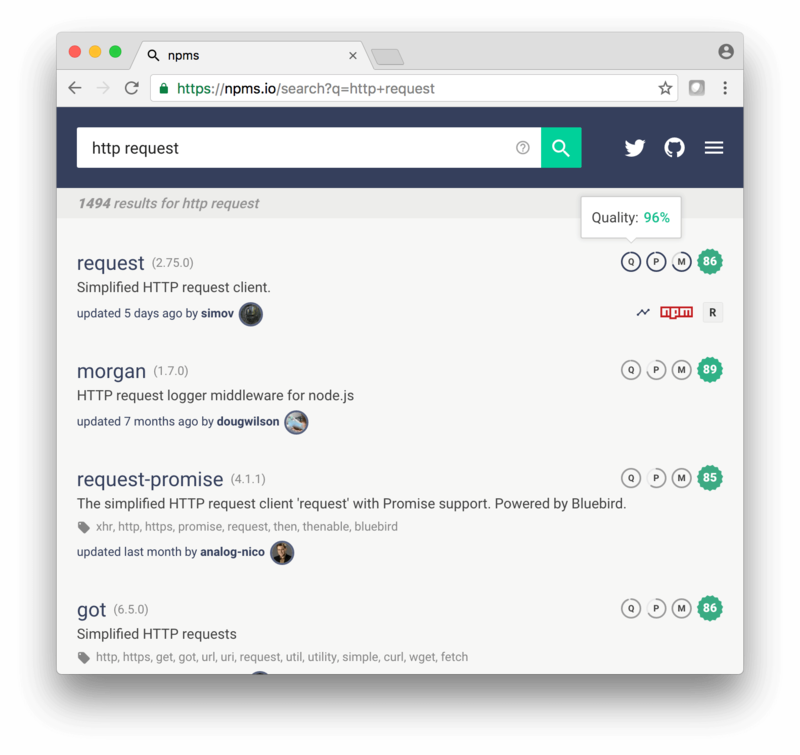 To automate this task, you can use Greenkeeper which will automatically send pull requests to your repositories once a dependency is updated. Development dependencies are called development dependencies for a reason - you don't have to install them in production. It makes your deployment artifacts smaller and more secure, as you will have less modules in production which can have security problems. In case of using npm with a logged in user, your npm token will be placed in the .npmrc file. As a lot of developers store dotfiles on GitHub, sometimes these tokens get published by accident. Currently, there are thousands of results when searching for the .npmrc file on GitHub, with a huge percentage containing tokens. If you have dotfiles in your repositories, double check that your credentials are not pushed! Another source of possible security issues are the files which are published to npm by accident. By default npm respects the .gitignore file, and files matching those rules won't be published. However, if you add an .npmignore file, it will override the content of .gitignore - so they won't be merged. When developing packages locally, you usually want to try them out with one of your projects before publish to npm. This is where npm link comes to the rescue. What npm link does is that it creates a symlink in the global folder that links to the package where the npm link was executed. You can run npm link package-name from another location, to create a symbolic link from the globally installed package-name to the /node_modules directory of the current folder. Let's see it in action! The next article in the Node.js at Scale series will be a SemVer deep dive with how to publish Node.js modules.